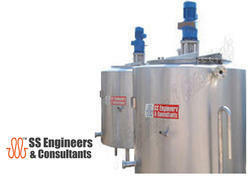 Our range of products include silos, dump tank, ghee making machine, milk boiler, rotary washer and paneer / khoa plant. 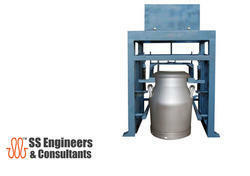 SS Engineers fabricate bulk milk storage equipment for dairies. 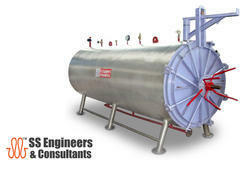 These milk storage tanks are available in different models to suit requirements. The standard models include vertical milk storage tank, horizontal milk storage tank, multipurpose milk tankers etc. 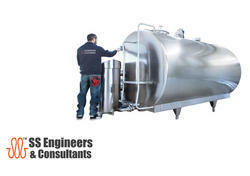 Our range of milk storage tanks finds wide usage in dairies and food processing units. 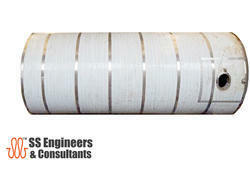 SS Engineers Dump Tanks are fabricated using SS304 sheet which is 2 mm thick. These are rectangular in shape. All its sides as well as corners are polished in a very effective manner that they meet the dairy standards. These tanks have slope from the three sides that enables easy drainage of liquid. Its outlet is manufactured using SS304 pipe and it is terminated with SS304 two way plug value which have SSEC make. Our tanks have four legs with ball feet and are manufactured by SS304. 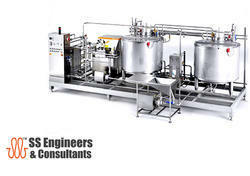 We are a reliable name offering different types of Ghee Making Machine. 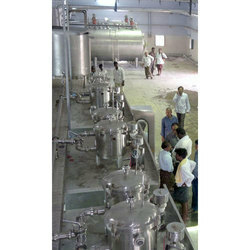 This equipment is developed as per client requisite in terms of capacity. The use of mild steel and stainless steel in making the product assures compliance with the set food safety norms. Owing to our rich experience and knowledge of this domain, we are engaged in manufacturing the premium quality of Can Washer Rotary Type. For washing and drying of milk containers, the rendered can washer is used in dairies and milk processing industries. Their trouble-free operations make the can washers highly appreciated among the patrons. SS Engineers & Consultant Rotary Washer Besides Crates, Bins & Tub washing equipments, SS Engineers & Consultants also manufactures Milk Containers washing equipment which operates cleaning in rotary direction. 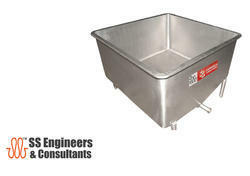 SS Engineer’s Rotary can washing equipment is compact in size, and can be operated by a single person. The machine functions for washing, sterilizing and drying of Milk containers, Cans, Can Lids through continuous operation. The capacity of the machine is to clean 200~300 cans per hour, giving a production rate of 2000 cans cleaning per shift of 8 hours. SS Engineers Rotary Washer prevent inter-splashing and mixing of waters between chambers, to insure a perfect cleansing of cans and covers, and to conserve heat and water. 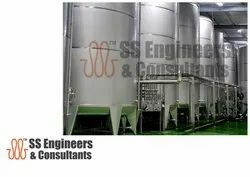 SS Engineers & Consultants offers complete plant for manufacture of Paneer and Khoa (milk products), SSEC work starts & include designing and fabrication of equipment viz steam jacketed stainless steel pan, paneer press, hooves, chilling vat, cutting knives etc for different production capacities of Paneer manufacturing and Khoa manufacturing. Panner: Paneer is a pressed preparation that is obtained by acid coagulation of milk at about 85°C, which is followed by removal of whey. As per the PFA rules (1976), the paneer should not contain more than 70 percent moisture and the milk fat content should not be less than 50 percent of the dry matter. Khoa: Khoa is a partially dehydrated whole milk product prepared by desiccation of milk to 65-70 percent total solids in an open pan. Milk contains nearly 83-87 percent water; in order to increase the concentration of milk, water is evaporated from the milk by boiling. Khoa is used as a base material for the preparation of variety of sweets like burfi, peda etc. SS Engineers manufacture Ghee Boiler from Cream / Butter, using steam as heating media, Glass wool of 100 mm thick in between the outer shell and intermediate shell. Scraper type, with vertical mounting geared motor of suitable R.P.M. Dia 38 mm SMS with union located at top. Will be provided with flange and counter flange outside the outer shell, it will be provided at the top most point of the steam jacket. 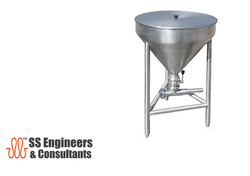 SS Engineers are an eminent manufacturer and supplier of funnel- ventury caps. These are available in a wide range and are manufactured as per the industry norms. These are fabricated by using high quality raw material obtained from reliable sources. These have 2 Butterfly Valves with M.S. stand and are painted with Aluminum paint. Further, these have railing S.S. 202 sq. S.S. Plain Tank and has a capacity of 1000ltrs. As per drg. Pipelines for Beverage Industries in accordance CIP Pipelines, Compressed Air, Process Gas Pipes, Suspension Preparation - the list is endless. With all the relevant material certificates. 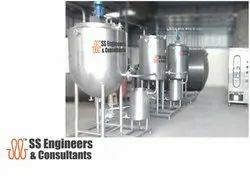 SS Engineers & Consultants Mini Factories are fully equipped with all necessities for a full technology cycle, including the Equipment for receiving and cooling of milk, pasteurization, separation, fermentation, packing of ready products. Apart from these, the lines, include all necessary auxiliary units and equipment such as: Compressor, Pumps, Filter, Auxiliary capacities, Dairy pipes, Valves, Electrical communications etc. SS Engineers manufacture Stainless Steel Industrial Plate Heat Exchanger and industrial heat exchangers to meet the diversified requirements of assortment of industries. Our set of industrial plate heat exchangers are manufactured from the amalgamation of superior technology like sealing technology and improved plate design. Gasketed Plate Design: With the big range of plate heat exchangers SSEC has got the optimal technical solution for any possible task, with connection sizes from Ø15 - Ø500 mm covering a liquid flow of 50 l/hour - 2000 m3/hour. The construction of the inlet part makes a perfect distribution of the liquids across the heating surface. The inlet part is increased and supplied with grooves preventing "dead spots" which may cause the growth of bacteria in the plate heat exchanger. The inlet with groves secures a strong inlet part with a minimum of contact points. Brazed Plates: Contrary to the traditional plate heat exchanger the brazed plate heat exchanger does not contain rubber gaskets and can thus operate continuously at the temperatures from minus 180 degree C up to plus 200 degree C. The operating pressure can be as high as 30 bar. Our series of heat exchanger plates is available for various range of SS 304, SS316, SS 316L. Our collection of PHE’s find their application in diverse industrial applications in chemical, offshore, oil & gas, petrochemicals power plants, pulp & paper, steel, sugar, vegetable oil, breweries & distilleries, dairy & beverages, and many more. 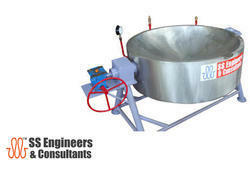 SS Engineers CUP Filling machine is suitable to fill liquid food like lassi, milk, juice, water, non-carbonated drinks besides yoghurt, curd and semi liquid flow-able food product. 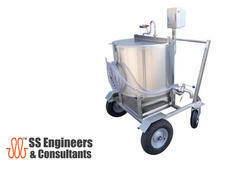 SS Engineers & Consultants offers these machine suitable to fill, pack up to 400 ml in a Cup to the max. The operating principal is based on the gravitation flow of liquid from the fixed head to the cups. The machine is designed to facilitate holding, filling, capping, sealing and unholding the filled cup to conveyor or turn table. 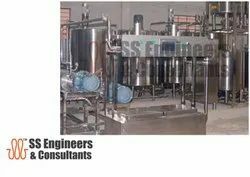 SS Engineers Cup filling machine is suitable for filling the inoculated milk / liquid having volume of 200 / 400 in the cup having dia of 80 mm to 95 + 3 mm, suitable for variable cup dimensions. SS Engineers machines are accurate in filling with a tolerance of 0.1%. Equipped with all the high-tech machinery, our organization is engaged in providing an extensive range of Milk Processing Machinery 1000-10000 LPH. Backed by years of experience of this domain, we manufacture and export the best in class of Bulk Milk Cooler. For the purpose of cooling bulk milk containers, the bulk milk cooler is used in dairy industry. Owing to its excellent cooling efficiency and low maintenance, the rendered bulk milk cooler is highly demanded. 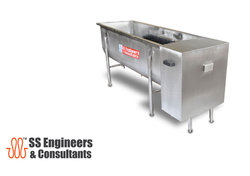 SS Engineers & Consultants manufacturers cooling tanks made of high-quality stainless steel, the sizes includes from 500 to 5000 liters cooling capacities. The basic understanding of milk cooling systems can help farmers make informed about their milk cooling compositions. The milk must be cooled at 18°C at the completion of the first milking in the milk cooling tank, and should not exceed 13°C at the completion of subsequent milking’s; The cooled Milk then to be maintained below 7°C till it is collected. Raw milk grows bacteria rapidly above 7°C, therefore it is important to cool milk at farm’s to maintain milk quality. 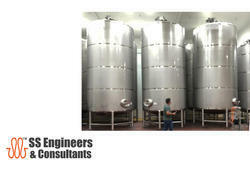 SS Engineers Milk Cooling Tanks are the best solution for cooling milk at the farms. Tank capacities available – 0.2 kl, 0.5 kl, 1 kl, 2 kl, 3 kl, 5 kl, & 10 kl. Valued as a reliable manufacturer and exporter, we render the superior quality of Can Scrubber. Ideal of scrubbing milk cans and containers in dairy industry, the rendered can scrubbers are available with us in various sizes and designs. Their high performance and low maintenance make the can scrubbers highly demanded. Can Scrubber is used for cleaning of 40 liter aluminum / SS milk cans, constructed with stainless steel body Immersion tank of 400 liter capacity. The Can cleaning activity is impossible by hand or may need quite laborious and time consuming. SS Engineers Can scrubbing washer is one good solution for milk farmers/ small milk processors to clean their Cans regularly before and after usage. SSEC Can Washer are equipped with Two Nylon brush suitable for 40 liter cans cleaning. Motor driven with 1 HP 1440 RPM 3 phase motor with gear box and driving chain making very reasonable operating cost. 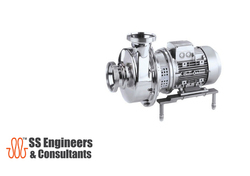 SS Engineers Homogenizer is a machine consisting of a positive displacement pump that forces the product under high pressure through a small adjustable gap between the valve and the valve seat, causing turbulence and intense mixing. Our ranges of high pressure pumps are reciprocating pumps that use a plunger to move media through a cylindrical chamber. Plunger pumps use a cylindrical mechanism to create a reciprocating motion along an axis, which then builds pressure in a cylinder to force fluid through the pump. The pressure in the chamber actuates the valves at both the suction and discharge points. These pumps are used in applications that could range from 70 to 600 bars. Working Principle: Homogenization is a process used to emulsifying one liquid into another or uniformly dispersing solid particles throughout a liquid to improve important product qualities. Leading Manufacturer and Exporter of Sanitary Unions such as SS Sms Weldable Unions, SS Din Unions, SS IDF Unions and SS SMS Expandable Unions from Rajahmundry. 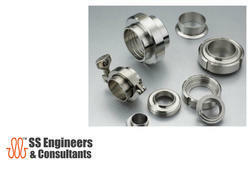 We are among the leading manufacturers and exporters of the superior quality of SS SMS Weldable Unions. Dairy, cement, paper, food processing and pharmaceutical industries, are some of the places where the rendered stainless steel SMS weldable unions are highly demanded. Due to our large production capacity, we manage the bulk demands of SS SMS weldable unions. 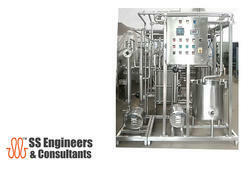 Being the market leader of this domain, we manufacture and export the premium quality of Bottle Sterilizer. Fabricated and designed as per the industry laid norms, the rendered bottle sterilizer is used in dairy industries for sterilizing large milk bottles in the most organized manner. By following total quality management, we assure that the quality of bottle sterilizer is never compromised at our end. 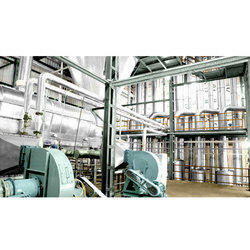 Process machines primarily used to process milk filled glass bottles. 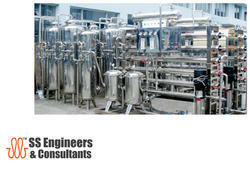 SS Engineers manufactures full range of bottle sterilizers (steam retort) from 150 bottles to 2880 bottles per batch. 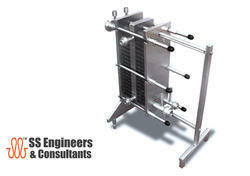 All retorts can be ordered in lengths from 1 basket to 8 baskets capacity. Customer options: includes automatic or manually-opened door designs. We offer orbit type door opening & closing. The customer may also specify MS. or SS construction. Uses: In dairy industries for sterilization of flavored milk bottles. 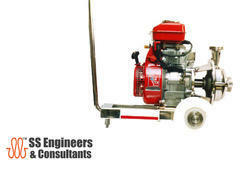 Engine Coupled Pump available models: t-20, t-35, t-50. SS ENGINEERS are engaged in offering a qualitative range of Ice Cream Plants, offered plant is used to create an iced up dairy product. We offer Ice Cream Plants to our clients as per their requirements and specifications. SS Engineers is one of the specialized Manufacturers Kova Making Machine. We can also design Kova Making Machine according to the needs of the customers. These machines can be developed in all sizes. 240 Ltrs Steam Jacketed Kova Pan of Tilting Type. The Inner Shell will be fabricated with SS 316G 5mm thk and the intermediate steam jacket will be fabricated with MS 6mm thk. The jacket will be insulated with 100mm thick mineral wool and cladded with SS 304 G 1.6mm thk sheet. The entire Kova Pan will be mounted on a frame made out of 65mm GI Pipe. The pan will be provided with tilting arrangement. The pan will be supplied along with the standard accessories such as 1” steam inlet connection with ¾” condensate assembly and pressure gauge, safety valve, air vent & temperature gauge along with the pan 2 no’s SS 304 G scrapper will be supplied. 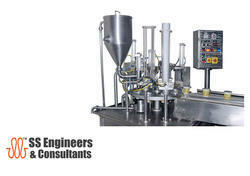 SS Engineers is one of the specialized Manufacturers Khoya Making Machine. We can also design Khoya Making Machine according to the needs of the customers. These machines can be developed in all sizes. 240 L Steam Jacketed Kova Pan of Tilting Type. The Inner Shell will be fabricated with SS 316G 5mm thk and the intermediate steam jacket will be fabricated with MS 6mm thk. The jacket will be insulated with 100mm thick mineral wool and cladded with SS 304 G 1.6mm thk sheet. The entire Kova Pan will be mounted on a frame made out of 65mm GI Pipe. The pan will be provided with tilting arrangement. The pan will be supplied along with the standard accessories such as 1” steam inlet connection with ¾” condensate assembly and pressure gauge, safety valve, air vent & temperature gauge along with the pan 2 nos SS 304 G scrapper will be supplied. 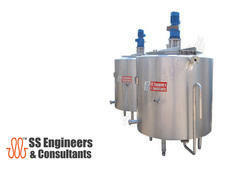 SS Engineers & Consultants are one of the established manufacturers and suppliers of a wide assortment of pasteurizers. We make use of latest technology available for our range, to leave no stone unturned in offering an immaculate range of dairy process equipment. 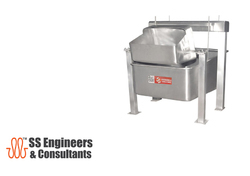 Precisely designed and developed these pasteurizers are very safe and secure to use and are also easy to maintain. Further, these are available in various capacities as per the choices of our clients. Road Milk Container, Road Tanker, Trabsport vehicle, with Base frame to suit the chassis of different vehicles, comes with locakable valve box. 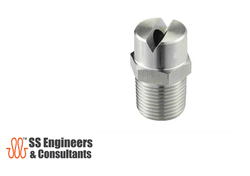 With the assistance of our professionals, we are engaged in offering our clients a broad range of SS Spray Nozzles. In tune with set industry norms, our provided nozzle is manufactured by our skilled professionals using the superior quality raw material and contemporary techniques. This nozzles is available in different sizes, dimensions and technical specifications for our clients. Apart from this, the offered nozzle is highly demanded in the market for its attributes like unmatched quality and seamless finish.